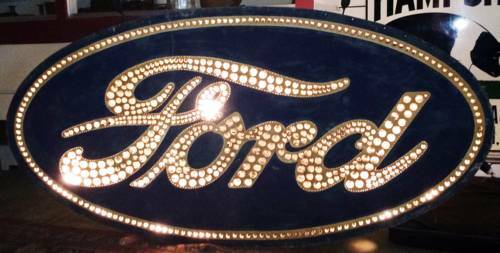 This spectacular punched-tin Ford dealership sign is an original double-sided example featuring smalt cobalt glass and measuring 36x72 inches. A nearly ancient practice primarily used for creating eye-catching signage, smalting is a process of adding ground glass, typically blue, to oil for canvas application, or atop a painted surface while the paint is still tacky. The overall goal is to create a depth, a texture that looks somewhat like velvet with a sparkle to what would otherwise be a surface coated in the flat sheen of paint. Used since the 1500s, mostly in the creation of signs to advertise businesses, the practice has all but disappeared from the commercial sign-manufacturing industry. As such, smalt signs are today considered truly special gems, especially those in remarkable condition such as this Ford oval. The pre-neon sign is double sided and lighted, extra unique, as most smalt signs were single sided and offered no illumination. This sign was meticulously cared for and displayed indoors throughout its lifetime, presenting in an amazing preserved condition today with all 12 electric lightbulbs in functioning order. The punches that allow the light through show beautiful cuts overall, crisp “C” shapes and drill holes for the smaller punches. 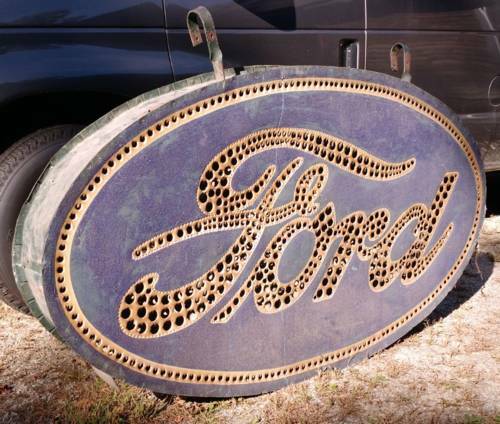 All in all, this is likely one of the nicest original smalt Ford signs in existence.